Brand reputation is everything; it’s the difference between customers and no customers. This reputation can be tainted with just one tweet or Facebook post and all brands are at risk. Whether they are ‘doing’ social or not, their customers most certainly are. That’s why it’s so important that every company, no matter what size, has a social media crisis management plan in place. You need to be prepared to defend your brand should things go wrong. Your brand’s reputation is at stake here and it only takes one false move to cause irreparable damage to your company or client. No pressure. Even if people aren’t talking directly ‘to’ you or engaging with you on your social profiles, you can bet that they’re talking about you somewhere else! Use tools such as TweetDeck to set up filters that enable you to monitor the social sphere for any mentions of your brand. This can help you keep track of brand mentions and get a quick overall picture of what everyone, not just your fans, is saying about you. This is particularly useful if you’re launching a new product or campaign, as this is likely to be the time when there are lots of conversations happening. It’s always a good idea to keep an eye on what else is going on in the world of marketing and learn from other’s mistakes. For example, unbeknownst to Greggs their logo was replaced with a rather unsavoury version on their Google profile. A disgruntled British Airways customer paid to launch a promoted tweet to complain about bad customer service. What would you do in these situations? Obviously these are worst case scenarios, but it’s always good to be over-prepared! A great idea is to run some ‘fire drills’ – it may be worth thinking about what you would do in these situations? Who would respond? Who would be on hand to speak to the press? Who would respond to the individual tweets/posts? Ensure that contact details for everyone on the team are saved and shared. Ensure all relevant departments are involved with creating the strategy- HR/PR/Legal/Retail. 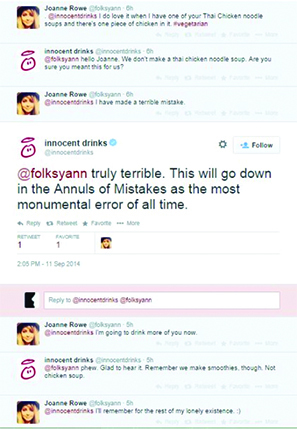 A social media crisis can evolve from any area of the business and will often require input from other departments. In other words, a social media crisis is not just for the social media team. It could affect your customers and your employees so make sure that all departments are on board when putting this together. For example; you’re the community manager for a restaurant chain and a customer makes a complaint about one of your staff making a negative remark, then takes to Twitter to let the world know. As a community manager you need a process in place so that the restaurant manager will alert you quickly rather than waking up to a viral Twitter meltdown! It’s virtually impossible to be on hand 24/7, so let your fans know when you’ll be able to respond. Include this in your social media disclaimer or even on your Twitter profile. Interflora do this on a daily basis. 5. Don’t put yourself up for the fall! Steer clear from hashtags that could be hijacked, *cough* Waitrose *cough*. 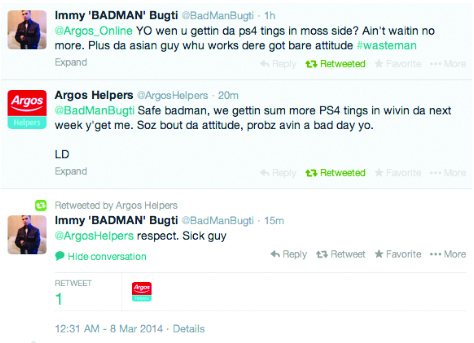 Before creating a social campaign or hashtag, play devil’s advocate and think of every possible outcome. That way you can prepare for every eventuality. First of all, breathe! Don’t panic and jump in all guns blazing. Speed is of the essence but don’t rush it. Take a step back and process these five things. Alert all relevant parties as soon as possible. Get your crisis team on board and ready to do their bit. For example, make sure your employees are aware; the crisis could affect everyone so make sure no one is left in the dark. Speed is of the essence, your brands reputation is at stake here. Therefore it is essential that you respond as soon as you can. Your customers/fans who have been affected by the crisis will want answers so it’s best that these come from you before anyone else! So although instinctively you will want to jump in, take a moment to think and process the situation. Think about different platforms, do you need to email your customer base/ issue a statement to the press/ post an explanation on Facebook? Every brand is different and every situation will be different, therefore you need to assess the situation and respond appropriately. If it’s appropriate, join in with the ‘banter.’ However, if the situation is more serious then a more concerned and corporate response would likely be more fitting. Always consider the tone of your responses and make sure they are appropriate but also on-brand. If you have made a mistake, admit it; take the wrap. Be transparent, apologise and explain yourself. Most importantly, show that you are taking steps to rectify the situation. 5. Can you spin it? If you manage to address the points above and successfully calm the storm, the situation could potentially be spun into a positive for your brand. You just need to think creatively and assess if there are any opportunities to reach out to your audience with a new message or creative spin on the situation. Take a look at our top 5 examples below for some inspiration! 1. 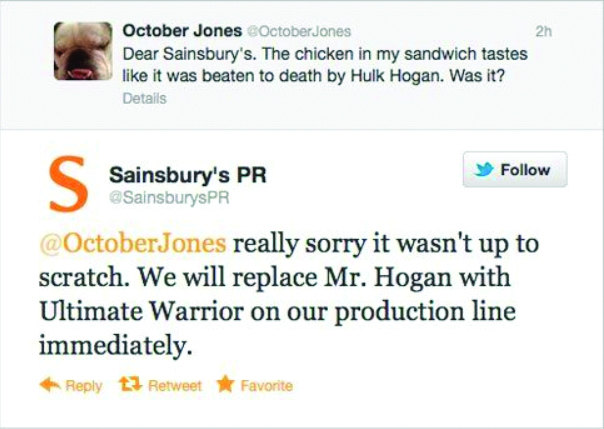 Sainsbury’s show how a customer complaint can be spun into a positive opportunity for a brand to show their human side. 3. O2 win over disgruntled customers with good customer service and humour..
O2 experienced widespread network problems affecting hundreds of thousands of its customers. A 2 day Twitter storm ensued, however rather than churning out textbook replies they responded with open, honest and human exchanges. 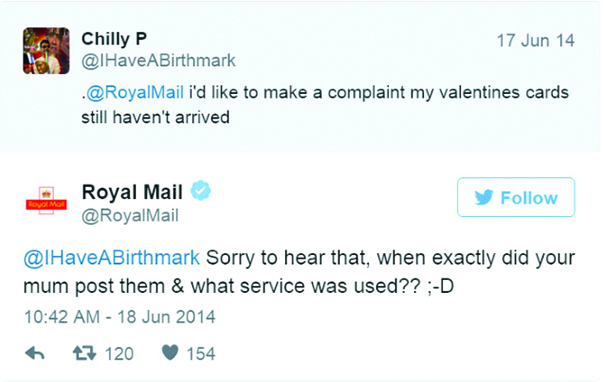 Tackling the issue head on with ‘real’ comments made them a winner on Twitter and ensured that they managed to retain their angry customers. O2 response: "Maybe later, got tweets to send"
This type of response is definitely not suitable for every brand, however, the right time, place and genius copywriter can be a beautiful thing…. In a nutshell, it’s important to have a crisis comms plan in place, just in case the unthinkable happens, but perhaps most importantly, you need to have a team around you to execute it. If you need some advice on how to prepare, get in touch with the Scouts, if they’re not available then give us a call.